“2016 was my first year competing and I knew I needed to get my posing down if I wanted to do well. My husband had heard of Tawna and recommended I check her out. I went for a consultation at Destination Dallas. The consultation exceeded my expectations and I immediately signed up for the 10 personal classes package. I had been working out for years before I decided to compete. But I had NEVER done any type of competitions so Tawna had her work cut out for her! Tawna customized a beautiful routine specifically for me and my body. She was patient and kind as she taught me at my pace. I never felt rushed or that I wasn’t learning quickly enough. She was able to read my mood the second I walked into practice and adjust our practices so I would get the most benefit out of each. She is extremely observant, intuitive and talented. I left the 10 weeks of coaching with her with a beautiful routine and a sense of pride and confidence I did NOT have before. “I love posing with Tawna because she is very direct and blunt. She doesn’t sugar coat stuff, she tells you like it is but she gives good constructive criticism and she in my opinion is one of the best performers and one of the best posers I’ve ever watched on stage. She knows her stuff for sure and her personality is so fun and outgoing she’s super funny and sweet. She gives direct specific comments that help you understand what you’re doing and help you make a change. She videos you and plays them back so you can actually see what you’re doing. “In March of this year I decided to compete in my first Bikini competition. The Kuclo Classic was just two short months away at the time. I met Tawna through my trainer just weeks before my show. I knew nothing about fitness competitions let alone anything to do with a posing routine. I was beyond thankful for Tawna taking me on under such short notice. She was exceptionally helpful in getting as many sessions scheduled as possible before the show. I’m tall, awkward and certainly no professional when it comes to walking in heels but in just seven sessions Tawna made magic happen! Without her help there would have been no possible way I would have been ready to present a routine on stage. 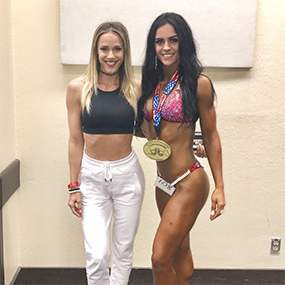 She was there at the show to give a couple last minute pointers and I was able to walk on stage and win the Novice Bikini. “I came into this sport with guidance from my coach to learn posing via YouTube. The frustrations were building, posing is HARD, probably the most difficult part of prep. So I searched the DFW area for a posing coach. I heard about Destination Dallas and Tawna being a phenomenal posing coach. I reached out and was SO glad I did. Tawna is one of the most caring, down to earth professionals in the sport I have met. She is extremely knowledgeable in her expertise. I went into meet her and was so nervous, but her demeanor and energy was relaxing. She works with each athlete to find what works for them. Their body, they angles, their poses. Each is individual and perfected. We went through multiple angles and poses until I found what worked for me on stage to deliver with confidence. Not only what made my body look the best, but what made me feel least likely to wobble, sway and step awkwardly.